(?) Tryban married Alice Hemberger, daughter of Ferdinand Hemberger and Anna Margaret Hutter. Married Name 20 January 1955 As of 20 January 1955,her married name was Alt. Janet Taylor married Louis F. Alt, son of Robert Alt and Anna Frances Ringelstetter, on 20 January 1955. Juanita (?) married Robert L. Alt Jr., son of Robert Alt and Anna Frances Ringelstetter. (?) Maly married Helen Alt, daughter of Robert Alt and Anna Frances Ringelstetter, before 1988. John Bartz was born circa 1908 at Wisconsin. He was the son of Laura E. Quackenbush. John Bartz married Lyle Minette, daughter of Leon Edward Minette and Grace Elizabeth Kroll, circa 1929. John Bartz and Lyle Minette were divorced after 1930. [S250] U.S. Federal Census 1930 U.S. Federal Census, by Ancestry.com, Year: 1930; Census Place: Madison, Dane, Wisconsin; Page: 29A; Enumeration District: 0041. Married Name 23 February 1914 As of 23 February 1914,her married name was Bartz. Laura E. Quackenbush was born in 1884 at Iowa. She died on 3 June 1928. Married Name after 1940 As of after 1940,her married name was Hemberger. Selma Gladys Wick was born on 27 August 1920. She married Richard H. Hemberger, son of Ferdinand Hemberger and Anna Margaret Hutter, after 1940. Selma Gladys Wick died on 17 October 1994 at Dane, Wisconsin, at age 74. (?) Kahn married Alice Hemberger, daughter of Ferdinand Hemberger and Anna Margaret Hutter, at first marriage for her. Married Name 18 November 1936 As of 18 November 1936,her married name was Greenheck. Fern Clements was born before 1919. She married Walter A. Greenheck, son of Arnold Greenheck and Rosina M. Hutter, on 18 November 1936 at Bear Valley, Wisconsin. Fern Clements died after 1998. Married Name Her married name was Kocher. Ada Bailey married Clarence L. Kocher. Ada Bailey was born in 1875 at Wisconsin. She died on 6 February 1949. [S373] U.S. Federal Census 1940 U.S. Federal Census, by Ancestry.com, Year: 1940; Census Place: Madison, Dane, Wisconsin; Roll: m-t0627-04470; Page: 12B; Enumeration District: 13-58. Clarence L. Kocher married Ada Bailey. Clarence L. Kocher was born on 7 June 1873 at Wisconsin. He died on 29 July 1922 at Wisconsin at age 49. Married Name Her married name was Bottorff. Married Name Her married name was Batdorf. Eva Elizabeth Rith married George Peter Batdorf, son of Johannes Martin Batdorf and Margaretha Elisabetha Walborn. (?) Temme married Alma L. Bentz, daughter of John Fred Bentz and Katherine E. Ehly, in 1988. Maria Catherine (?) married Martin Weiser, son of John Conrad Weiser and Maria Margaret Batdorf. Levi Vickers was born in 1902. He was the son of Tyre Samuel Vickers and Nellie Tanner. Levi Vickers died in 1903. George L. Vickers was born in 1903. George L. Vickers died in 1904. Married Name 6 August 1890 As of 6 August 1890,her married name was Jambor. Anna Krejci was born in 1868 at Bohemia. She was the daughter of Frank Krejci and Barbara Janos. 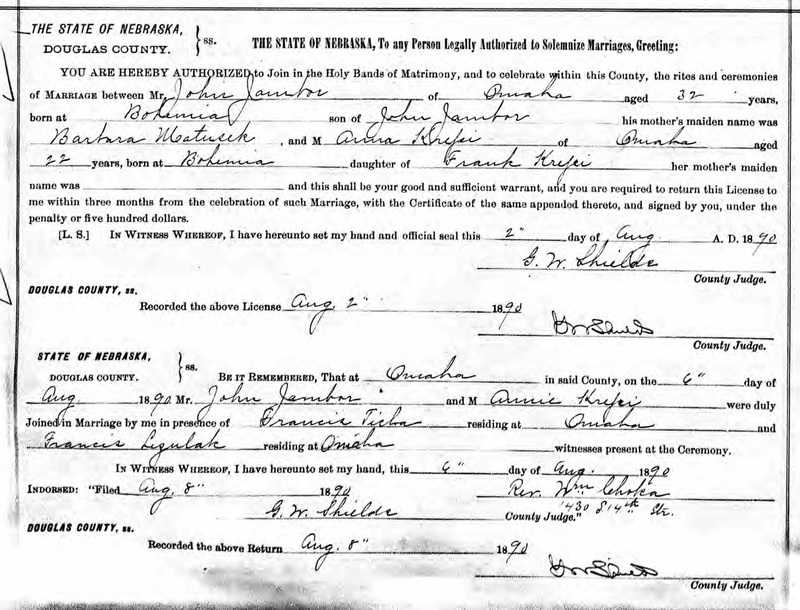 Anna Krejci married John J. Jambor on 6 August 1890 at Omaha, Douglas, Nebraska, Marriage record of John Jambor and Anna Krejci. Anna Krejci died in 1943. She was buried in 1943 at Saint Mary Cemetery, Omaha, Douglas, Nebraska. [S244] U.S. Federal Census 1910 U.S. Federal Census, by Ancestry.com, Year: 1910; Census Place: Omaha Ward 2, Douglas, Nebraska; Roll: T624_843; Page: 5B; Enumeration District: 0012; FHL microfilm: 1374856. [S243] U.S. Federal Census 1920 U.S. Federal Census, by Ancestry.com, Year: 1920; Census Place: Omaha Ward 5, Douglas, Nebraska; Roll: T625_988; Page: 6A; Enumeration District: 52. [S250] U.S. Federal Census 1930 U.S. Federal Census, by Ancestry.com, Year: 1930; Census Place: Omaha, Douglas, Nebraska; Page: 16B; Enumeration District: 0061; FHL microfilm: 2341009. John J. Jambor was born in 1862 at Austria. 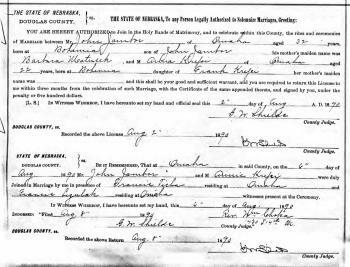 He married Anna Krejci, daughter of Frank Krejci and Barbara Janos, on 6 August 1890 at Omaha, Douglas, Nebraska, Marriage record of John Jambor and Anna Krejci. John J. Jambor died in 1942. He was buried in 1942 at Saint Mary Cemetery, Omaha, Douglas, Nebraska. John J. Jambor immigrated in 1885. He was a Blacksmith for the Railroad in 1910. Charles Wiebelhaus was the son of Albert Ferdinand Wiebelhaus and Kathryn M. (?). Charles Wiebelhaus died before 2018. Donovan B. Wiebelhaus was born on 3 December 1933 at Nebraska. He was the son of Albert Ferdinand Wiebelhaus and Kathryn M. (?). Donovan B. Wiebelhaus died on 18 November 2017 at age 83. Levi Timothy Frohreich was born on 11 November 2017. He died on 14 November 2017 Levi Timothy Frohreich, son of Jessica Frohreich, was born and baptized as a child of God on November 11, 2017, and went home to his Heavenly Father on November 14, 2017. Memorial services are 1:00 PM, on Saturday, November 18, 2017 at the Wintz & Ray Funeral Home in Yankton, South Dakota with Reverend David Gunderson officiating. The family will receive friends a half hour prior to the service. Levi was loved by his mother, Jessica Frohreich of Yankton; brother, Caiden; grandparents, Tim and Brenda Frohreich of Yankton; uncle, Jacob Frohreich of Middletown, NY; great grandparents, DeWane and Betty Frohreich of Yankton; and many great aunts and uncles. Levi was preceded in death by his great grandparents, LeRoy and Amanda Neugebauer. I wish they knew how much your life mattered to me, that I will always remember you. Until we meet again, my beautiful angel baby, my sweet little Levi. Henry Borgman married Dorothy Hultgren, daughter of John Alfred Hultgren and Esther O. Ericson. Esley John Hultgren was the son of John Alfred Hultgren and Esther O. Ericson. Esley John Hultgren died at died in infancy. Erv Blaue married Alwayne Edith Delaney on 30 December 1942. Erv Blaue died on 21 April 1963. Lloyd Saugstad married Alice Jervik. Married Name Her married name was Saugstad. Alice Jervik married Lloyd Saugstad. Ronald Saugstad was the son of Lloyd Saugstad and Alice Jervik. Ronald Saugstad died before 2016. Name Variation Leland Stanley Saugstad was also known as Lee. Leland Stanley Saugstad was born on 18 January 1941 at Beresford, South Dakota. He was the son of Lloyd Saugstad and Alice Jervik. Leland Stanley Saugstad died on 8 March 2016 at South Dakota at age 75 Leland Stanley Saugstad was born January 18, 1941 in Beresford, SD to Lloyd and Alice (Jervik) Saugstad. He died March 8, 2016 at Sanford in Sioux Falls, SD at the age of 75 years, one month and 20 days. Following his graduation from Alcester High School he served for four years in the US Air Force. He was stationed in Michigan, Florida and in Germany. Lee married Jean Jensen in Beresford, SD on December 9, 1959. He returned to the Beresford area where he farmed with his father and a brother. Lee was a full time member of the SD Air Guard in Sioux Falls where he worked in munitions until his retirement. He then worked for Tendaire/Electrol and at Rosenbaur America. He liked to fish, and more recently, to do crossword puzzles and to go for drives around the area looking at crops. He is survived by his wife Jean of Beresford; , three sons, Ronnie (Wanda) Saugstad of Beresford, Ryan (Teresa) Saugstad of South Sioux City, NE and Erik (Angie) Saugstad of Beresford; 8 grandchildren, three brothers, Lloyd Doug “Babe” (Sandra) of Alcester, Paul (Mary Ellen) Saugstad of Beresford and Lloyal (Sharon) Saugstad of Waubay, SD; sister, Kathleen Lykken of Hudson, SD. His parents, brother, Ronald, and son, Jason, preceded him in death. A memorial gathering for Leland Saugstad will be from 2-4PM Friday, March 11th at Klassix (formerly the VFW Legion Hall) in Beresford. Jason Saugstad was the son of Leland Stanley Saugstad. Jason Saugstad died before 2016.